loh.tar updated the diff for D20815: Ensure highlighted folding marker after unfold. loh.tar added a comment to D20815: Ensure highlighted folding marker after unfold. I think about a patch to issue the foldingPreview in case of unfold when done by click on the icon bar. Unfortunately would that need some bigger changes at the toggleFolding functions to return what was done. loh.tar requested review of D20815: Ensure highlighted folding marker after unfold. loh.tar committed R39:0d70744ed67b: Fix broken InlineNoteTest (authored by loh.tar). loh.tar closed D20697: Review IconBorder. loh.tar added a comment to D20606: Add action to toggle folding of child ranges. 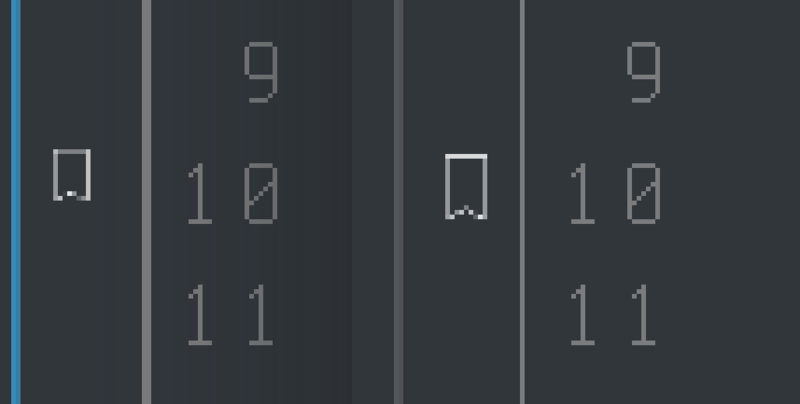 I would prefer a context menu that has this as action. This is much better discoverable and also extensible with more folding actions. I agree. Right-click should show a context menu. Middle-click could toggle, if you need it. loh.tar committed R39:57781f34d234: Review IconBorder (authored by loh.tar). loh.tar updated the diff for D20697: Review IconBorder. loh.tar added a comment to D20722: ViewSpace: Don't ASSERT, just check for valid doc to remove from tab. loh.tar committed R39:d9171c391267: Paint the folding marker in proper color and make it more visible (authored by loh.tar). loh.tar closed D20742: Paint the folding marker in propper color and make it more visible . loh.tar requested review of D20742: Paint the folding marker in propper color and make it more visible . hm, can't say much helpful to your patch. Send you my BT. But from my point of view is this assert here redundant. When you dislike my check, you can drop the assert anyway. loh.tar added a comment to D20697: Review IconBorder. Did you test that the annotation border still works? You can do so in KDevelop by invoking git blame. Out of the blue run I into this issue. The only slightly unusual before was, that I had a confirmation box regarding an unsaved file while quit the session. Then, when I want to restart the same session, it crached always. If you like I can submit the BT, but think it's not needed to approve this patch. loh.tar requested review of D20722: ViewSpace: Don't ASSERT, just check for valid doc to remove from tab. @dhaumann Beside these annotation stuff I think I'm done with this now. Should you, or someone else, not stop me in the next few days I may treat this as OK and push it. loh.tar updated the test plan for D20697: Review IconBorder. Simplify "additional folding highlighting", there is now the slightly gradient gone, bad? loh.tar added a comment to D20264: Add test for "Auto Reload Document" option. loh.tar requested review of D20697: Review IconBorder. loh.tar abandoned D20565: Ensure not to fold the end marker. loh.tar closed D20606: Add action to toggle folding of child ranges. loh.tar committed R39:5c83e29561e3: Add action to toggle folding of child ranges (authored by loh.tar). loh.tar committed R39:f5f715ea1441: Add test for "Auto Reload Document" option (authored by loh.tar). loh.tar closed D20264: Add test for "Auto Reload Document" option. loh.tar updated the diff for D20606: Add action to toggle folding of child ranges. Replace old two actions "Fold/Unfold Current Node" by "Toggle Current Node"
hm, there is already a folding action in the View menu. I understood Dominik so, not to add a context menu to the icon border, but to add the action to the context menu of the "edit range". Whatever, as said I'm not in the mood for that, and it should be done in a 2nd patch, when needed. But a context menu on the icon border would I very much dislike. Middle click is not so handy and perform atm "paste to begin of line"
Oh, may that fit too? A possible improvement could be to add slots to make the folding accessible by some keyboard action, but I'm not in the mood for that now. loh.tar requested review of D20606: Add action to toggle folding of child ranges. loh.tar updated the diff for D20565: Ensure not to fold the end marker. loh.tar requested review of D20565: Ensure not to fold the end marker. loh.tar added a comment to D17857: DocumentPrivate: Don't jump view when edit using 'scroll past last line'. Yes! A short test looked very promising. Looks to me a call to KateLayoutCache::updateViewCache may help at some point. But have no idea where to place and with which parms. In KateLayoutCache::displayViewLine is "limit=0" on second call. Did anyone tried this patch? loh.tar committed R39:78a2e5d1daa5: DocumentPrivate: Respect indention mode when block selection (authored by loh.tar). loh.tar closed D19450: DocumentPrivate: Respect indention mode when block selection. loh.tar abandoned D19511: ViewPrivate: Disable read-only mode action when doc is modified. To relieve the maintainer it's droped now. But I still have the feeling there could be something improved at these "Read-Only Stuff"
loh.tar committed R39:cfb0af25bdfa: ViewInternal: Fix makeVisible(..) (authored by loh.tar). loh.tar closed D17857: DocumentPrivate: Don't jump view when edit using 'scroll past last line'. loh.tar updated the diff for D19450: DocumentPrivate: Respect indention mode when block selection. loh.tar committed R39:dc0e01ce0915: Fix testAutoBrackets (authored by loh.tar). loh.tar updated the diff for D19254: [RFC] KateRenderer: Show tabs and space characters the smart way. I spend a couple of time for this stuff. Would be nice someone else could try it or do some investigation with tools I'm not familiar with, and don't want to be atm. Without feedback I will push it in the next few days. loh.tar committed R39:8f0813f6c7ed: DocumentPrivate: Make bracket handling smart (authored by loh.tar). loh.tar closed D19608: DocumentPrivate: Make bracket handling smart. loh.tar committed R39:1a0da40ae3da: ViewInternal: Review drop event (authored by loh.tar). loh.tar closed D19691: ViewInternal: Review drop event. I think KateViewInternal::updateView is called for cursor blinking for instance. May that be an issue? loh.tar requested review of D20495: KateIconBorder: Fix folding popup width and height. loh.tar committed R39:c95655f845da: KateIconBorder: Use UTF-8 char instead of special pixmap as dyn wrap indicator (authored by loh.tar). loh.tar closed D20434: KateIconBorder: Use UTF-8 char instead of special pixmap as dyn wrap indicator. loh.tar committed R39:6ba329f8d451: KateIconBorder: Ensure Dyn Wrap Marker are shown (authored by loh.tar). loh.tar closed D20431: KateIconBorder: Ensure Dyn Wrap Marker are shown. loh.tar committed R39:6906368aa6b3: KateIconBorder: Code cosmetic (authored by loh.tar). loh.tar closed D20425: KateIconBorder: Code cosmetic. loh.tar updated the diff for D20434: KateIconBorder: Use UTF-8 char instead of special pixmap as dyn wrap indicator. loh.tar added a comment to D20434: KateIconBorder: Use UTF-8 char instead of special pixmap as dyn wrap indicator. loh.tar requested review of D20434: KateIconBorder: Use UTF-8 char instead of special pixmap as dyn wrap indicator. loh.tar added a comment to D20431: KateIconBorder: Ensure Dyn Wrap Marker are shown. loh.tar requested review of D20431: KateIconBorder: Ensure Dyn Wrap Marker are shown. loh.tar requested review of D20425: KateIconBorder: Code cosmetic. loh.tar added a comment to D20343: fix handling of sub modules in git rely on ls-files --recurse-submodules, there since end of 2016. Fix this Bug 398240 - Files appear twice in project view for some git projects ? loh.tar added a comment to D19926: Add Bookmark Handling. a good compromise could be to put the "Bookmark" menu under the "Tools" menu. loh.tar added a comment to D20357: Make buttons in seach bar nicer (icon, tooltip, autoselect). loh.tar committed R39:ad4cd4a72508: DocumentPrivate: Support auto bracket in block selection mode (authored by loh.tar). loh.tar closed D19446: DocumentPrivate: Support auto bracket in block selection mode. loh.tar accepted D20343: fix handling of sub modules in git rely on ls-files --recurse-submodules, there since end of 2016.
loh.tar updated the diff for D20264: Add test for "Auto Reload Document" option. loh.tar added a comment to D19446: DocumentPrivate: Support auto bracket in block selection mode. loh.tar requested review of D20264: Add test for "Auto Reload Document" option. Hmm, I think this counts as a bug. Have trouble to reproduce now. Was that fixed somewhere? Qt? Strange. loh.tar updated the diff for D19446: DocumentPrivate: Support auto bracket in block selection mode. Set proper start/end column independent from selection direction. loh.tar committed R39:81a8d573ecaf: DocumentPrivate: Add option "Auto Reload Document" to View menu (authored by loh.tar). loh.tar closed D19517: DocumentPrivate: Add option "Enable Auto Reload" to ModOnHdPrompt. loh.tar added a comment to D19517: DocumentPrivate: Add option "Enable Auto Reload" to ModOnHdPrompt. As you see, not only the menu is changed, so I update this diff for your approval. loh.tar updated the diff for D19517: DocumentPrivate: Add option "Enable Auto Reload" to ModOnHdPrompt. loh.tar committed R39:135269639e70: Fix to previous commit eb90ca52 (authored by loh.tar). loh.tar committed R39:eb90ca5231f4: DocumentPrivate: Support to set dictionary on block selection (authored by loh.tar). loh.tar closed D19425: DocumentPrivate: Support to set dictionary on block selection. Could the "view_auto_follow" be implemented in a second review after this is commited? loh.tar added a comment to D20083: Multiple level of autobrace. loh.tar committed R40:5d28eaaf9041: PreviewWidget: Avoid preview update when doc type is not supported (authored by loh.tar). loh.tar closed D19637: PreviewWidget: Avoid preview update when doc type is not supported. loh.tar added a comment to D18793: Handle text completion with block selection mode. Fix this patch also Bug 382213 ? No, it doesn't fix it. loh.tar added a comment to D19785: DocumentPrivate: Review del/backspace. I had recently submit a patch which was also affected by RTL text D19621. Should this patch here be accepted I can upload my current state of the mentioned playing, which works similar as that D19621. It's for me very frustrating to test because I never know what is to be expect or what currently happens. Your Qt report make it even worse. loh.tar added a comment to D19771: Use placeholder instead of label. The idea is that we don't need a label if there's appropriate placeholder text.